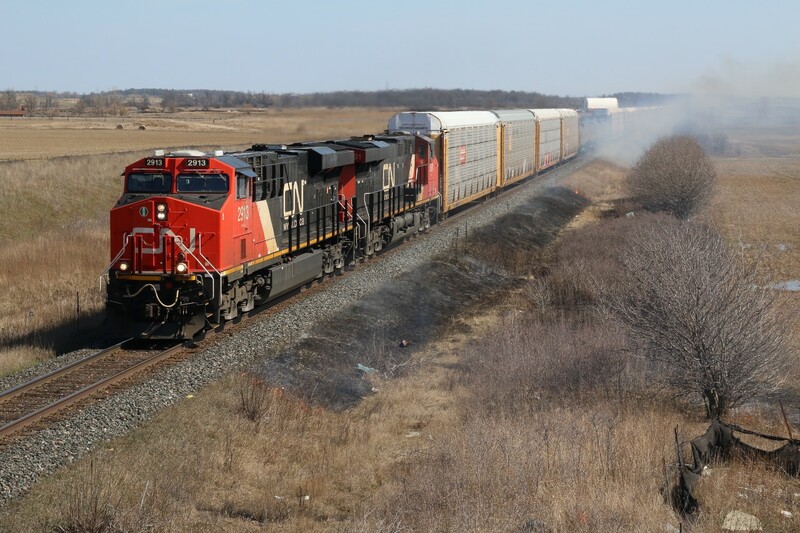 Railpictures.ca - Marcus W Stevens Photo: With highway 401 closed in both directions through Milton due to a truck roll over I was forced to head south of town. CN trains 551 and 382 were block on block so I chose the new Louis saint Laurent bridge to catch the action, unaware of excitement to come. I missed 551 by a couple of minutes but soon noticed numerous small fires winning the roadbed through town set by a sparking wheel set. I soon figured 382 would be held at Ash until the fires were extinguished, but I was quickly surprised by a headlight breaking through the smoke, fanning many of the fires. It wasn’t long before the bridge was packed with curious observers. | Railpictures.ca – Canadian Railway Photography – photographie ferroviaire Canadienne. Caption: With highway 401 closed in both directions through Milton due to a truck roll over I was forced to head south of town. CN trains 551 and 382 were block on block so I chose the new Louis saint Laurent bridge to catch the action, unaware of excitement to come. I missed 551 by a couple of minutes but soon noticed numerous small fires winning the roadbed through town set by a sparking wheel set. I soon figured 382 would be held at Ash until the fires were extinguished, but I was quickly surprised by a headlight breaking through the smoke, fanning many of the fires. It wasn't long before the bridge was packed with curious observers.